Works by a diverse group of artists were created in response to a challenge from the Museum to create an artwork that expresses what “freedom” means today. This exhibition is a companion to Rockwell, Roosevelt & the Four Freedoms, on view at the New-York Historical Society. Image caption: Deborah Samia’s “The Four Freedoms (A Tribute To Norman Rockwell)” is flanked by the War Bond Posters featuring Rockwell’s Four Freedoms paintings. 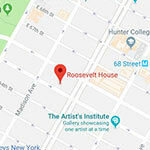 (NEW YORK, MAY 23, 2018) To mark the 75th anniversary of Norman Rockwell’s iconic paintings of Franklin Delano Roosevelt’s Four Freedoms, the Roosevelt House Public Policy Institute at Hunter College is debuting the new art exhibition Reimagining the Four Freedoms. The show, soon to go on a national tour, presents original works by contemporary artists considering the legacy and relevance of the Four Freedoms, and reinterpreting them for our time. Chosen in a juried competition from more than 1,000 entries, the selected artworks include paintings, sculpture, drawing, photography, video, and mixed media. They explore such concerns as mass incarceration, immigration, the Black Lives Matter movement, and women’s rights, and in some cases adapt or reinterpret famous Rockwell images into visual commentaries on 21st-century issues. The show was organized by the Norman Rockwell Museum in Stockbridge, Massachusetts, as a component of the exhibition Rockwell, Roosevelt & the Four Freedoms, which runs concurrently at the New-York Historical Society. Reimagining the Four Freedoms opens to the public on May 25. On Thursday, May 31, the Norman Rockwell Museum and Roosevelt House will host a panel discussion at the house featuring four of the featured artists (attendance by reservation only). The Office of War Information raised millions of dollars by using the images in its war- bond-drive posters. When Eleanor Roosevelt guided the writing of the Universal Declaration of Human Rights at the United Nations from 1946 to 1948, she incorporated and expanded the Four Freedoms into that text, one of the most important documents of the 20th century. In the decades since the publication of the original Rockwells, the images have appeared in every medium and have become reference points for many other artists. In conjunction with the Four Freedoms exhibition, and on the occasion of the 75th anniversary of the paintings, the Norman Rockwell Museum issued a call to artists, inviting them to ponder what these freedoms mean today. The submissions were reviewed by a jury of artists, scholars, and museum professionals: Liza Donnelly, cartoonist and writer for The New Yorker; Wendy Tarlow Kaplan, independent curator and art historian; Anita Kunz, award-winning illustrator and Officer of the Order of Canada, Canada’s highest civilian honor; Robyn Phillips-Pendleton, Associate Professor of Visual Communications at the University of Delaware, Newark; Maurice “Pops” Peterson, artist in residence, Massachusetts Commission Against Discrimination; Stephanie Haboush Plunkett, Deputy Director and Chief Curator, Norman Rockwell Museum; Chuck Pyle, Director of the Illustration Program, Academy of Art University, San Francisco; Melanie Reim, Professor of Art, Fashion Institute of Technology, New York; John Wetenhall, Director of the George Washington University Museum and the Textile Museum; and Setsuko Sato, artist and former National Public Radio producer. The jury chose works by 36 artists from the US and Canada. Three other artists were invited to contribute their work. Included in the show are paintings by artist Daisy Rockwell, granddaughter of Norman Rockwell; and art by two of the jurors, Robyn Phillips-Pendleton and Maurice “Pops” Peterson (whose studio sits opposite Rockwell’s onetime home and studio in Stockbridge). Reimagining the Four Freedoms opens with an introductory section exploring both the origins of the Four Freedoms and Norman Rockwell’s artistic process in creating the paintings. A masterful portrait of President Roosevelt by artist Frank O. Salisbury firmly establishes his key role, and is accompanied by reproductions of the 1941 speech that featured his call for the Four Freedoms. An original Saturday Evening Post from February 28, 1943, is open to the pages where Rockwell’s Freedom of Worship is printed with an accompanying essay by historian Will Durant. Original war bond posters featuring Norman Rockwell’s Four Freedoms paintings share a wall with four plaster bas relief plaques by contemporary artist Deborah Samia, who has replaced the people in the Rockwell originals with a much more diverse population. Juxtaposed with the Four Freedoms are eight paintings by Daisy Rockwell, concerned with women who have been accused of petty crimes at the moment of their induction into the criminal justice system. The exhibition continues on the main floor with the work of artists exploring the meaning of the Four Freedoms today with both original images and examples referring to different Rockwell works. A vivid portrait of an African-American baseball player painted by Robert Selby on a large, freestanding door has the word “Colored” faintly visible. The back of the door is painted white with the visible word, “White,” and together both sides represent the artist’s recall of a childhood in the segregated south. A photograph by Soody Sharifi, The Game, evokes Norman Rockwell’s work created for Look magazine New Kids in the Neighborhood — except Sharifi’s teenagers are a more diverse group. Peter Zierlein’s poster sounds the alarm about attacks on freedom of speech while Jane Feldman’s photograph celebrates freedom of religion. In fabric art, Esther Iverem’s quilt Through Many Dangers, Toils, and Snares traces a journey through African-American history, while Amy Wike’s knitted Refuge incorporates a sentence from President Roosevelt’s Four Freedoms speech in three refugee languages. Daisy Rockwell’s striking images of women in her Arrested series speaks to the harsh American propensity to jail people for minor offenses, while police brutality against African Americans is reflected in Maurice “Pops” Peterson’s interpretation of Rockwell’s Freedom from Fear in Freedom from What? The many other paintings, prints, and mixed media artworks in the exhibition will challenge and engage visitors as they consider the meaning of the Four Freedoms today. The exhibition also includes three videos. One is the actual newsreel footage of President Roosevelt delivering the Address to Congress that included the Four Freedoms, offering a chance for visitors to hear his strong and resonant voice. Another video, by artist Sara Dilliplane, mixes political imagery and speeches. The third, by Tim Needles, presents 40 people answering the question: what freedoms are important to them? A special feature of the Roosevelt House exhibit is the inclusion of labels presenting student commentary on the works of art. Twenty-four students in the undergraduate Public Policy and Human Rights programs at the House wrote reflections in response to the art, and included reference to many contemporary issues that fall under the Four Freedoms. Their short essays reveal their passion to improve health, safety, housing, environment, and employment opportunities for those suffering from want and fear, racism and war, and their commitment to uphold the freedoms of speech, the press, and religion. Their responses exemplify the continuing relevance of the Four Freedoms to a new generation. The presentation of Reimagining the Four Freedoms at Roosevelt House has been curated by Deborah Gardner, Historian/ Curator at Roosevelt House, in collaboration with Curator Stephanie Plunkett of the Norman Rockwell Museum. Generous assistance was provided by Roosevelt House staff and faculty members Aaron Lee Fineman, Daniel Culkin, Kelsey Adolphs, Joanne Vellardita, Sandra M. Nunez, and Mark Shulman, along with the Directors of the Public Policy and Human Rights programs at Roosevelt House—Shyama Venkateswar and Smita Narula, respectively—and the operations staffs of Hunter College, and colleagues from the Norman Rockwell Museum. The exhibition will be open for viewing Monday-Saturday, 10:00 am-4:00 PM, and during Saturday tours and special evening events. Guided tours of Roosevelt House are offered every other Saturday at 10:00 AM, Noon, and 2:00 PM, and group tours by appointment. To make reservations, please consult the website. Following its inaugural presentation in New York City at Roosevelt House, Reimagining the Four Freedoms joins the tour of Rockwell, Roosevelt & the Four Freedoms, traveling to The Henry Ford, Dearborn, MI, October 13, 2018 – January 13, 2019; The George Washington University Museum and The Textile Museum, Washington, D.C., February 9 – May 6, 2019; Museum of Fine Arts, Houston, TX, December 15, 2019 – March 22, 2020; [Venue to be Announced, July 4 – September 20, 2020]; and the Norman Rockwell Museum, Stockbridge, MA, Fall 2020. Support for Reimagining the Four Freedoms is provided by Ford Foundation. Leadership support for Rockwell, Roosevelt & the Four Freedoms is provided by Jay Alix, The Alix Foundation and the George Lucas Family Foundation. National Presenting Sponsor is The Travelers Companies, Inc. Major support provided by Anonymous, Michael Bakwin, Helen Bing, Elephant Rock Foundation, Ford Foundation, Heritage Auctions, Annie and Ned Lamont, National Endowment for the Arts, and Ted Slavin. Media Sponsors: Curtis Licensing, a division of the Saturday Evening Post, and the Norman Rockwell Family Agency. 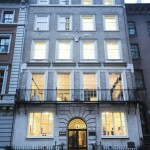 Roosevelt House, an integral part of Hunter College since 1943, re-opened in 2010 as a public policy institute honoring the distinguished legacy of Franklin and Eleanor Roosevelt by educating students in public policy and human rights, supporting faculty research, fostering creative dialogue, and making the Roosevelts’ achievements available through tours, exhibits, and public programs. The Institute provides opportunities for students to analyze public policy and experience meaningful civic engagement; for faculty to research, teach, and write about important issues of the day; and for scholarly and public audiences to participate in high-profile lectures, seminars and conferences. Hunter College, located in the heart of Manhattan, is the largest senior college in the City University of New York (CUNY). Founded in 1870, it is also one of the oldest public colleges in the country. More than 23,000 students currently attend Hunter, pursuing undergraduate and graduate degrees in 170 areas of study. Hunter’s student body is as diverse as New York City itself. For almost a century and a half, Hunter has provided educational opportunities for women and minorities, and today, students from every walk of life and every corner of the world attend Hunter.